The Sprout recently completed his Permaculture Design Certificate through Oregon State University! Despite his back injury over a year ago, Jesse has used this time to seek knowledge about how to be a steward of the earth. It’s been fun to watch him learn this new language and fall even harder for the practice it describes. When you can’t stop talking about something, it’s a pretty good sign that you’re in love with it. What is permaculture? Jesse would tell you it’s a design process and methodology for creating human settlements and agricultural efforts to work with nature, not against it. If you’re interested, here are some permaculture definitions by people in the field. If you’d like some keywords, think harmony, sustainability, resiliency, creativity, diversity, and balance. As far as I can tell, this permaculture thing is not just for hippies. It’s a practice that has measurable benefits. It offers solutions to this no small matter of how to ensure the health of the human race while caring for the planet and the many beings that rely on its resources. It seems like a systematized way of describing what indigenous people have been practicing for generations. As I absorb the knowledge through osmosis, I’m beginning to see that it’s a way of living in abundance without harming our assets. It’s hope explained. It’s harmony described. 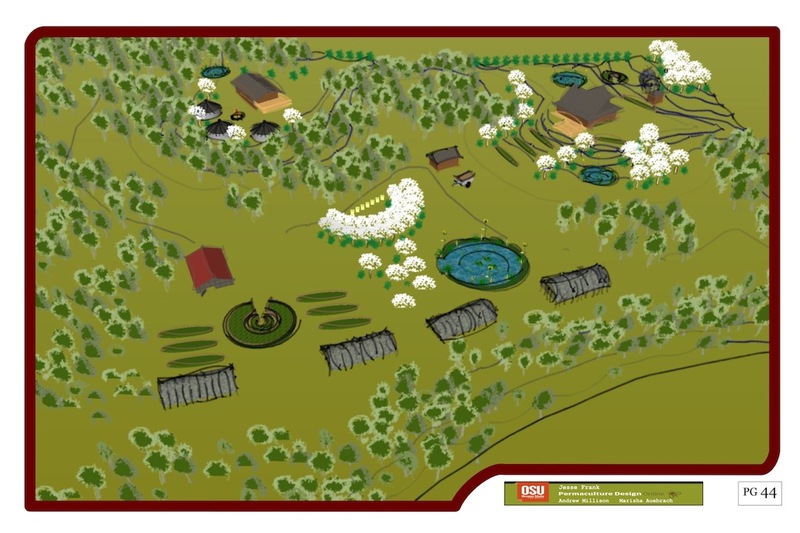 For his permaculture design project, Jesse chose a 20-acre piece of property we know and love and imagined his dream farm. It features food forests of fruit and nut trees, berries, herbs and mushrooms. 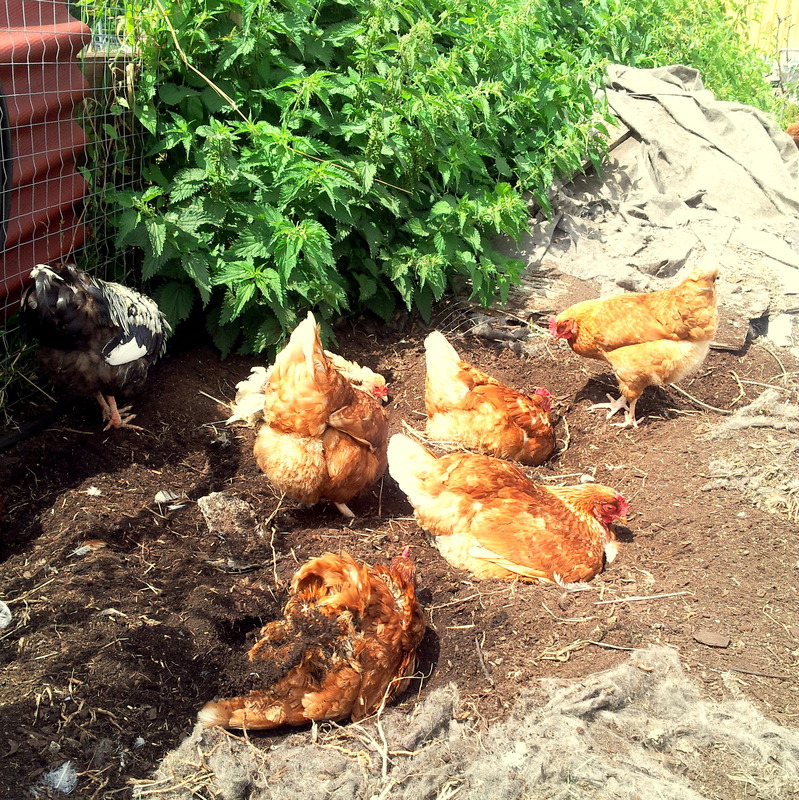 Pigs, chickens and ducks would provide food and ensure the fertility of the land. Ponds across the property offer swimming areas for ducks, a place for fish to be raised, and water collection points. It looks dreamy, as you can see from the conceptual drawing below. Conceptual drawing from Permaculture design project by Jesse. I am fascinated by these concepts. Thinking every day about how I will start putting things in place in our current urban setting as practice before we move to the village. I start school in January and am really looking forward to getting additional knowledge to help us reach our goals. Thanks for sharing our post and sharing your story. Sounds very exciting. I will be checking in on your blog to see how it’s going. Wow, do I ever long for a village. We need it, us humans. What education are you starting in January? I will be going back to school for an AAS in Environmental Horticulture. As if i need to add to my degrees… BA & MS. Part of my “worker retraining” program in prep for our move. Be careful what you wish for. 😜 Village life may sound great (and it is) but it is really tough too. We will be facing a lot of challenges and learning a lit of new things. I look forwaed to reading your blog regularly. It sounds like you and your partner have been very thoughtful about how you’ll adjust to the next phase(s) as a couple and as individuals. I look forward to reading your blog too!